In doing a bit of research on a Corning Ware pattern, Indian Summer, I found it was first introduced in 1977. When Pappy and I got married.....in 1977.....I had no desire for a set of "formal" dishes, much to the dismay of some family members. Instead, I chose the Indian Summer Corelle dishes and I've never tired of them. I had an advantage, too, as to how I was able to get them. At the time, my Daddy worked at House Hasson Hardware Company, a wholesale distributor. He was able to get the dishes, along with some other goodies at great prices. Sometimes he would even find bargains in what they called the "morgue". It was an area of damaged goods, but most of the time it was just the packaging not the contents. 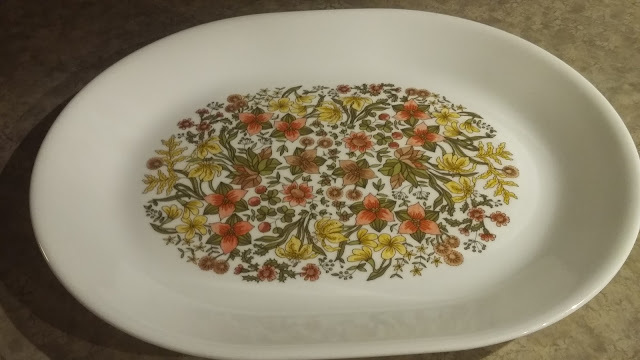 I thought y'all might be interested in seeing what this pattern looks like and also my favorite Corning Ware, Spice of Life. It's also vintage 1970's. There's an 8-place setting and would you believe none have ever been broken? way too many pieces considering how little I cook. Do y'all have a formal set of dishes and a set for everyday, too? These days, I don't even use my Corelle dishes that often but I would never part with them. I'll let Jess do that after I'm no longer in the picture.....;-) Since it's just Pappy and me, we use a couple of pretty Melamine plates I found at Wal-Mart! 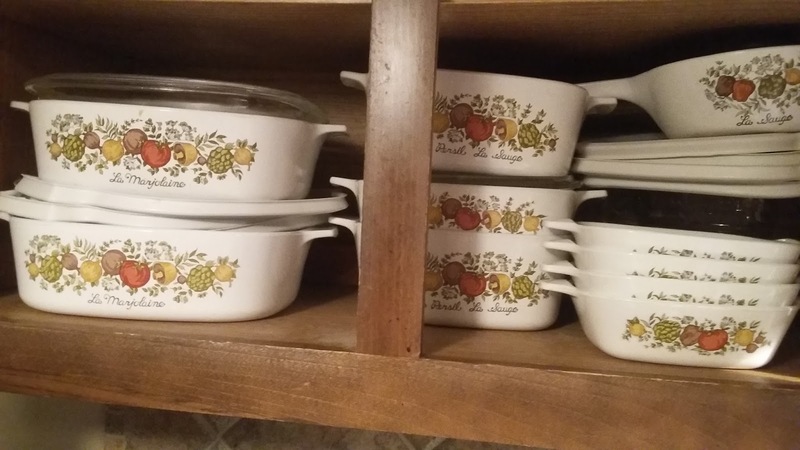 My mom has that very same design and I was raised on Corelle and as a matter of fact, she game me my own set almost 28 years ago when we got married. Debbie, you will have to visit up here and see the Corning Museum. When we moved here, my husband bought me my first (and only) Antique French china cabinet and a complete set of antique local rose china dishes. This area is known for their china and pottery. But, yes, formal, everyday and other pretty dishes for the holidays, lol. I am a "dish" hog, love dishes. Have a beautiful day friend and thank you for the memories, smiles. so very pretty!!! I use corelle too! Well, I have a complete set of plain white Corelle Ware dishes that we use for every day (if we aren't using paper plates!). I have added some mis-matched pieces to it when I see them at flea markets, especially the bowles. I have a few of the Cornflower cooking pieces, but now can only use them in the microwave. I tried using one on my cooktop (even though the manual said not to) and it broke in half. What a mess I made. I have a complete set of 16 settings in Pfaltzgraff and I have 12 place settings in my Noritake china. I'm giving the China to our granddaughter. Haven't used it in years. I set the table with the Pfaltzgraff for company. Your patterns are colorful and very nice! I feel like I just stepped back into time! :) We had these too. I absolutely love vintage! I was born in 1956 and love everything vintage, even from the early 1900's. Your dishes are beautiful! Thank you so much for sharing. Love your dishes! I don't remember the Corelle Pattern, but do remember the corning ware casserole dishes in that pattern. I had the cornflower blue corning ware and still use them. 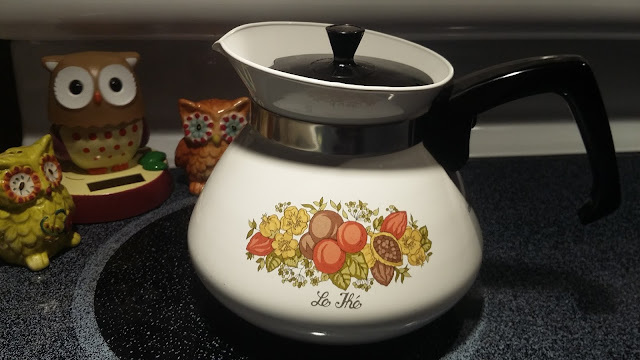 For dishes, I had a Noritake "Thea" pattern for my "good china", which I rarely use because it has a platinum edge and shouldn't be put in the diswhasher! Yikes! I also had an every day pattern by Syracuse China, "Carefree Calypso China"..Trinidad is the pattern. I don't have too many pieces of that left, so I don't use it very often. I use Currier & Ives Early Winter blue and white dishes for most holidays and a cheap sunflower set for every day. I have way too many dishes, but we entertain a lot...(and often use paper plates...) Thank you for sharing your delightful dishes! That was fun. I really like the design on your corelle ware. 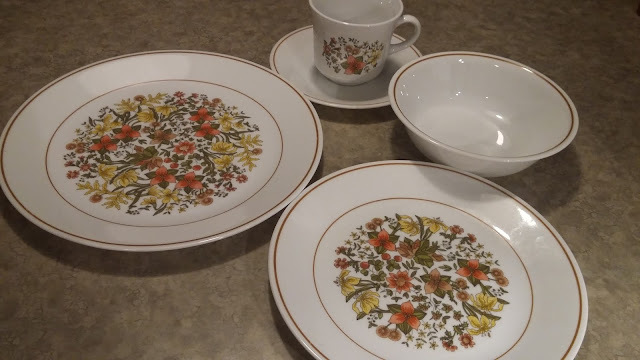 I found a set of china that I love at the thrift store, of all places, a couple years back and gave my other dishes to my daughter. We mostly use disposable plates because I do not enjoy washing dishes so I don't have a different set for all occasions and sometimes I wonder why I even have a real set at all. Wow! I had the same set years ago. I used to have a formal china set I received as a wedding present but rarely used it. Now I use a stoneware set from Walmart :) I too had a whole corning ware set and still use some pieces today. 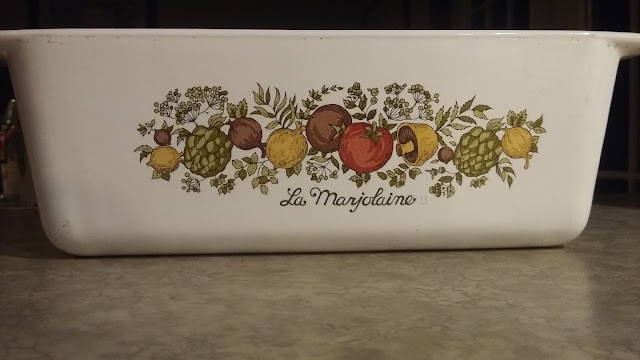 I love those Corning vintage patterns. I always wanted the Corelle Blue Heart pattern but they stopped making it long, long ago. However, I was able to find some on EBay. It took me three different sellers to be able to get a full set. I love them. I do have a set of "for good" china which my mother bought me as a wedding gift when Alan and I married. They were from the grocery store where you could buy a place setting for a very small price if you bought a certain amount of groceries. They are very pretty and I've used them for Thanksgiving and Christmas. They certainly aren't what most people think of as fine china but they are pretty to me. I remember seeing your pattern. It is so pretty and they are very durable! Thanks for sharing them.